A bright comet is an awesome sight. The best of them resemble glowing tufts of cotton wool, unfurling their gossamer tails so far across the sky that your outstretched hand could not cover them. Unlike shooting stars, which suddenly flash out in the fashion of a sky rocket, comets hover serenely against the background of stars, like a finger admonishing the inhabitants of Earth below. 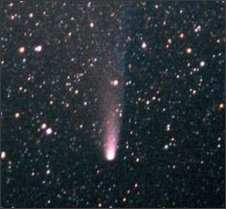 A comet’s flowing tail gives an impression of a headlong dash that is entirely illusory. In reality, its movement against the stars is noticeable to the naked eye only over a period of hours, or from night to night. A comet looks like a portent, and it is not surprising that people always regarded them as such. Writing 2000 years ago, the Roman astrologer Marcus Manilius summed up the prevailing opinion: ‘Heaven in pity is sending upon Earth tokens of impending doom’. Included in his list of cometary ills were blighted crops, plague, wars, insurrection, and even family feuds. In short, anything could be blamed on comets, and usually was. Similar beliefs prospered in the Far East, where comets were called ‘broom stars’. From a Chinese tomb of 168 BC, archaeologists have uncovered a set of paintings on silk which amount to an identification guide to various forms of comet tails and the events they were said to foreshadow, including wars, famine, and death. Not everyone took an unremittingly gloomy view. In AD 77, the Roman writer Pliny the Elder, in his book Natural History, gave his version of how to interpret a comet: ‘If it resembles a pair of flutes, it is a portent for the art of music; in the private parts of the constellations it portends immorality; in relation to certain fixed stars it portends men of genius and a revival of learning; in the head of the northern or the southern serpent [i.e. Draco and Serpens] it brings poisonings’. In the West, beliefs about comets were influenced for more than 2000 years by the Greek philosopher Aristotle, who declared in the fourth century BC that comets were strictly atmospheric phenomena. In Aristotle’s cosmology, the Earth was stationary at the centre of the Universe, and all celestial bodies – the Sun, Moon, planets, and stars – revolved around the Earth on spheres of pure crystal. Nothing could be allowed to violate the perfection of the heavens, so that any temporary blemish such as a comet had to be assigned to the atmosphere. According to Aristotle, comets were produced by gases that rose into the upper atmosphere where they caught fire, apparently being ignited by sparks generated by the motion of the heavens around the Earth. If the gases burned quickly, they produced the sudden flash of a shooting star. If they burned slowly, a comet was the result. In the second century AD, the Greek astronomer Ptolemy reported in his Tetrabiblos that comets contained everything you needed to make a detailed prognostication, provided you knew how to read the signs aright: ‘They show, through the parts of the Zodiac in which their heads appear and through the directions in which their tails point, the regions upon which the misfortunes impend. Through the formations of their heads they indicate the kind of the event and the class upon which the misfortune will take effect; through the time which they last, the duration of the events; and through their position relative to the Sun likewise their beginning.’ Similar claims were still being made in the Middle Ages, and such beliefs have not entirely died out even today. Of all the ancient writers on comets, the one to emerge with most credit is Lucius Seneca, a Roman of the first century AD. Seneca contested Aristotle’s view that comets were sudden fires, arguing instead that they were celestial bodies moving on orbits like planets and that they might reappear, given time. Prophetically he wrote: ‘Men will some day be able to demonstrate in what regions comets have their paths, why they move so far from the planets, what is their size and constitution’.